I can’t believe I’m first. So for cryin’ out loud, hire a cleaning service. And find a grocery store that delivers. Being self-sufficient is fine, but there are limits. Too true. Infants and first time mothers only happen once. Seriously. And subscribe to a meal service like Chef’s Plate. Honestly I’m not sure where the idea/need for one person to do it all has come from but it’s impossible and it’s painful to read when there are so many options out there. No one likes to do homework or grocery shop (well most people don’t) and if you are crunched for time you are crunched for time. Hire some help. This!!!!!! This is what I came here to say! Because really, this is the time to splurge. For everything in your life, you need to spend time or money. Spend the money on a cleaning service, even temporarily (one or two cleanings), and enjoy that time with your daughter and grandson! I agree with this group entirely. No shame in having a cleaner. I came to reply to say this exact same thing. Money is for hiring people to do the washing up for you while you snuggle that baby while it is still a baby. Problem solved. Or if not a weekly service, a one time sanity treat. Yes, I know it won’t be exactly how you would do it but sanity in a grandmother is a good thing (though laughter and eccentricity are also highly prized too). Enjoy it. All of it. Even the cleaning, when you get around to putting down the needles, will be satisfying, because you will SEE the difference, and then it’s done, so you can go back to grandmothering. Bliss. I agree wholeheartedly on the cleaning service at least once. And yes, grocery delivery. And a laundromat that will wash, dry and fold your clothes and linens. No. It won’t be just the way you’d do it — not the laundry, not the groceries, not the cleaning. But it will be done! And you won’t be cross-eyed crazy trying to do it all. Heck, I’d start a GoFundMe for you, if I could figure out how. Seriously, does anybody know how to do this? I’d contribute and I’m sure I’m not the only one. Look what the Blog can do for the Bike Rally. I’m sure we could do it for Stephanie and Meg too. No, don’t do it without asking. Many people do not like other people coming into their homes to clean. 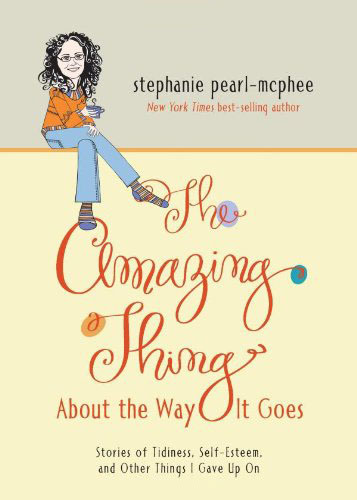 I get the idea that Steph is telling us that life is busy right now, and that she is letting certain things slide. That doesn’t mean she’s not OK with that. She has picked her priorities. I’m getting the idea that twe think she still has to do it all or get it all done. Instead of thinking that it can’t all get done at this moment. It will all get done, in Stephanie’s own time. It feels like yesterday: household (there is never an end to see, lets’ be clear…), little / teenage kids (sometimes out of control), brocken Mr. Washie (no Budget to replace it – must be Murphys’ Law…), no coffee in the house, and on and on! Hey, this woman knows how to solve all the daily tasks! The first six Weeks should be resting and snuggeling time for the young family, time to become a strong family and getting a Good Start. Stephanie has become a Grand-Mother, of course she needs time to settle in, and she is doing Care-Work for the baby, her daugther and son-in-Law. And she is giving care to herself: Knitting! I agree that a cleaning service at least once, grocery delivery where you can order online and laundry service at least once so that you can get your house organized would be a short term solution and then maybe it would easier to keep up. I’m with them – was thinking of it as I was reading the blog. Cleaning service and you stay there and direct, they can do the laundry drill as well. Time is precious and this is the first grandchild. 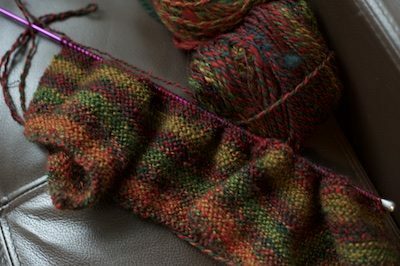 Beeeautiful handspun – what a lucky lad he is, in so many ways. That was running through my head as I read this blog post! What they all said!! In your city for a blessed 6 weeks of grandchild time and my darling son-in-law has already booked the cleaner “because we don’t want you to do that instead of playing with the little guy.” Of course, if your life was organized, it would be hard for the rest of us to like you as much as we do!! But still: cleaning service=less crazy + more knitting time. I was going to apologize for sounding so harsh. All I meant was that sometimes you have to let go of your pride and independence and accept help when you can find it. Grandbabies grow up fast, and you don’t want to miss a moment. So pay someone else to do the boring stuff, and knit that boy some sweaters! I just found what looks like a stone hard orange next to someone’s computer…. We have a crash of dust rhinoceros in out house. The dust bison will keep, but that little munchkin will grow so fast… There’ll always be time for cleaning. Cuddle while you can! No contest. Hire somebody to clean while you go fuss over the baby and his mum and dad. Thank you for sharing that you can’t do it all and that you are perfectly imperfect. Must give yourself permission to let go and hire the cleaning service–and,oh, yeah–don’t do the guilt trip thing and tidy the place up before they get there. Trust me, they’ve seen worse! Enjoy the visions of Elliot in all those wee knitted things dancing in your head and on your needles. I spent 6 lovely weeks with my granddaughter and her poor C-section mother, and nobody’s house was clean. I feel you. Hang in there. Joe probably loves you and Megan and Elliott more than he dislikes cluttered surfaces and a few dust elephants. For Godssakes, Steph, get the cleaners in before the Blog has a collective nervous breakdown. Do it for us if not for yourself. It’ll really be okay. I promise. I wash our towels after about seven uses. There are no babies here. We’re fine. You’ll be fine. People in the West wash their clothes (and themselves) way more than is usually necessary, anyway. Think of it as living a more eco-friendly, time-efficient, natural life. I like this idea! I’ll borrow it to assuage the “I should…” guilt. I’m with everyone else. Hire someone to come in couple times a month. When we both work full time, we have thee cleaning fairies in regularly. Life is too short to be spent cleaning toilets. Really? To short for cleaning my own toilett? I’m sorry, I really don’t want to sound rude, but this is too strange. I do not know you in person, and am giving my appologizes right now, but on this Planet there is no evidence for fairies of any kind. By paying somebody to do my tasks, in reality, I am externalizing my problems and hassels of Life to somebody to do my “boring work”. This People are allways underpaid, if not worse. You can always pay them more if you like! I personally don’t like people to clean my toilets, but I don’t mind them vacuuming. Cleaners through an agency often don’t get a good deal, but self-employed people can earn good money. I’ve been a cleaner, too, so I don’t feel so bad hiring one…. EZ’s BSJ does well with lots of stripes. If you combine the 2 yarns, you will surely have enough. I think they look nice together. I guess everyone is with me on hiring a housekeeper or cleaning service. Knowing that my housekeeper is coming forces a level of organization and tidying on us so that she can do her job. Probably I could have an imaginary housekeeper and get half the job done, but it’s really nice to have someone come in for a couple of hours and do the kitchen, bathrooms, and floors. I try to clear the clutter (paper, mostly) off the horizontal surfaces and leave the dirt for the cleaning person. I only have her come sporadically, but I have to say, coming into my house and smelling the fresh lemon scent, seeing a shiny stove and sink, and having a clean bathroom is the biggest treat ever. You said it yourself — he’s only going to be little for a short period of time, and there’s no sense in missing it if you don’t have to. As long as you aren’t in risk of being featured on an episode of Hoarders, I think you’re fine. It is SO true. You tidy for the housekeeper(s) knowing that they are coming. It helps to keep everyone sorted (and the housekeepers sane). So nice to know that I’m not the only one who lets the cleaning go….one more day. I totally grok your state; my dear daughter in law got me the cutest little puppy for an early birthday, (after I recently said goodbye to my senior teacup poodle buddy). Crate training has become my mantra. Not the Harlot here, but a Nonna with nine grandchildren. I would NEVER make anything for a child that wasn’t able to withstand the washer and dryer. Busy Moms won’t bother to handwash (nor should they), so if you want your knitting to last past one puke or spill, use super-wash.
Well, as a mother, I will never use superwash or acrilyc near a baby skin and lungs. Too many issues with petrochemistry. A good washing machine will be gentle with your knitting. As you can see from the replies you’ve already gotten, there are divided views! My recommendation is always to think about what the baby’s mother would prefer. So, I haven’t seen a picture of Joe with the baby. I am not trying to put him in a position where he is not comfortable as not everyone wants their picture taken! Or posted on the Internet either. I just imagine he is as smitten as can be with this new so adorable little human. quite a fifties notion of “women’s work.” I would be happy if you had the time to write every day or show us what you’ve been able to knit with your freedom. Thank you for the blog. Oh! My! Goodness! My thoughts exactly! My house exactly! Except the laundry is pilled in the living room and there is no room for people. I think if I knit a bit then I will be ready to attack the CHAOS! Where are the elves when they are really needed? 1. Send Millie to her Uncle Ken’s. She’ll get fed and her litter box WILL get cleaned. 3. One of The Ladies just gave you a grandson. Did the other two fall off a cliff? 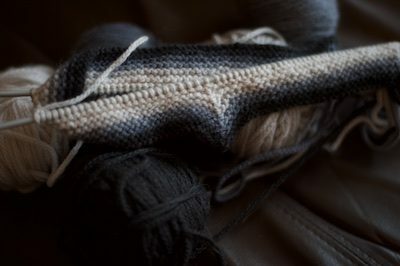 If they want another handknit….! 4. Have the lawn service guy use his leaf blower to herd the dust mastodons and move them outside. There! A reasonably clean house! It sounds so fantastic and like such a great start to everyone’s relationship with Elliott. My smallest kid is 8 and I am still dealing with the fallout of no support ever for anything of any kind. Kids seem fine though! I think we have this in common, this need for tidiness but actually carrying out regular cleaning tasks just takes the back seat to more important things like family and work. I’ve been fighting strep all week and couldn’t afford not to work, so now my own house is a pit, but at least my family is healthy and the weather is nice. That little sweater is gorgeous! 10 MINUTES LAUNDRY reminds me of the joyfully incoherent times following the arrival of my children. The days when every possible moment was spent in baby bliss. For everything else in life the deal was choose two: eat, sleep, shower, shop, tidy. I’m imagining that welcoming grandchildren will be just as joyous and even more wonderfully exhausting. A house needs to be clean enough to be healthy, dirty enough to be happy. I love the lullaby for the dust bunnies! Enjoy this time, dear Harlot! Clean houses are overrated. Tiny babies are necessary stuff of life! Give yourself a break, hire a cleaning person 1x a week for a month to get you all back on track… then snuggle the baby while someone else cleans the house. Ok, first a new baby in the family should STOP a family and person in their tracks. Don’t fight it, instead prioritize that unabashedly. Do the easy thing, hire someone to do things you can’t get to at this transition. Like cleaning the house, doing the laundry, organizeing the yarn etc. for a month or two. DONT FIGHT IT…. Applicants must be approved by Stephanie & Joe. Like you said, he’s going to be little for only so long. Enjoy him and his momma and daddy. There’s nothing like it it the world. The rest of the stuff will work itself out. And yes, I agree completely. The baby needs more knitted things. Absolutely.. It sounds to me like you have everything that matters in control completely! Housework is never done. Martha Washington has been dead for over 200 years and someone is still cleaning her house. I need to get a handle on things as well, but I haven’t the excellent excuse that you have. Do the bare minimum necessary and leave the rest for another day. Cuddle that baby as much as you can! Here’s to having the right priorities. I’ve been a grandmother for six years, and my house has never been the same – and I don’t care. I will take any chance I can get to be with my little ones. Any time spent with a grandchild is a special time. I welcomed my first grandchild, a beautiful little girl, in February, and I felt a huge stab of jealousy when you mentioned your 15 hours/week of grandmothering. I would love to be able to do the same! Fortunately my daughter and her husband live only a couple of hours away, but the distance combined with a job that holds me down on weekdays means that my grandmothering is done in 12- or 24-hour stints every two or three weekends, all except the block of time I was able to book off work right after the baby arrived. How I would love to be able to do the quick popping-in that is part of your life with your daughter and little grandson. Wearing a shirt with baby puke over the shoulder provides a great excuse for showing off the baby pictures to anyone who notices the shirt! I agree! Very good items. Why not employ someone to help with cleaning at home? Swallow your pride. You can pay a decent wage and offer a decent job to someone. It would be a win-win situation. Life is too short to put cleaning before anything at all!! Enjoy your grandbaby and knitting and family. The dust and clutter will be there when you’re ready. Or maybe the cat will take care of all of it like the compost? Your priorities are perfect. Just don’t invite anyone over until after Elliot’s first birthday. It’s so great that you are in the same city as your daughter and her family! My parents were three time zones away from their parents and siblings when my sister and I were born. I often wonder how they managed. Enjoy the baby time! It is a one-time situation indeed. One bleak day after I scrubbed the toilet and its vicinity (because, yes, my son was a baseball pitcher…but that didn’t mean he could hit the toilet…and his Dad was worse), the decision was made to have a housecleaner come in once a week to dust, sweep, and clean bathrooms. Household is much happier. I try to spend about 5 minutes sorting through refrigerator and tossing items whose time is up on Friday afternoon (because my husband dumps the trash on Saturday am). If I know I will be home on Sunday, I also try to get grocery shopping done on Friday…then cook meals that will serve for more than two days during the week. And, we do takeout (we are somewhat rural…so we don’t have the choices that must be available in Toronto.) And I usually make a salad that will last several days as well. When the dust bison get big enough, you can card, spin, and knit them…maybe wait till you have enough to finish Joe’s gansey. Happy one month birthday to Elliot! I don’t think there has ever been a woman who, on her deathbed, regretted not doing more housework. You are so lucky to have Meg, Alex and Elliott near enough to pop over and snuggle, help, and visit. The vote here seems to be nearly unanimous–get a cleaning service and order groceries online for awhile! You can’t hire someone to do any of your other work, but this, you can, so give yourself a break–you’ll not only help someone who is working to support_their_ family, but you will also gift Elliott with a calmer, saner, less stressed Grammy. Worth every penny! and not complaining about housekeeping. Steph, enjoy every moment right now. If you want to hire help, the Blog has your back. As long as the cat isn’t stuck to the floor you are doing fine. I will tell a tale from the second day home with second kid and a planned c section. It was about 5 pm, the hungries were setting in and neither hubbs nor I had a plan for food for the three of us with teeth. The door bell rang and it was a gift package from Omaha Steaks. The most welcome baby gift ever. In an hour we had a lasagna on the table. I still remember the tears I shed when I opened the box. You are a gift Grandma. Hire a cleaning service! There is no shame in hiring someone to clean your home. Anyone who pulls that is jealous. I’m single, no kids, one cat, a full-time job, and a part-time job, and I have a housekeeper. Why? Because when I have free time, I want to spend it on what I want to do, not cleaning my house. I also have a yard guy. Again, so I don’t have to spend what little free time I have doing yard work. If you need justification, here it is: By hiring a housekeeper, you’ve given someone a JOB. That person can now buy food, pay rent, clothe themselves and their family, pay taxes, contribute to the community… You’re not being lazy, you’re stimulating the economy. I applaud your sensibility on what is important, babies, first time mothers and knitting. The house is fine and will be there when Elliot is grown. My mother died young and my MIL could have carried less for babies. I hope when my time comes I can do Grandmotherly things. This is my life, without the baby to snuggle. Congratulation on your new grandson! Since my daughter had her daughter just a few months ago, I have also been very involved in her life. What joy! Yes the more mundane chores in life have gone by the wayside to make room for snuggling, kisses, playing, and singing. She is also my favorite model, and my daughter has dressed her in handmade sweaters and hats since birth. Have a good time. The cleaning will be there tomorrow. So quiet down cobwebs, dust to go sleep. Keep right on with what you’re doing, Steph, it’s the right thing!! I go to bed thinking the same thing! It doesn’t usually work out for me either. I’d definitely choose snuggling a baby and knitting for him too. Enjoy it! I agree with most of the replies and your priorities. Babies grow up fast and you don’t get that time back. Use the outside services you need for at least for a little while so you can enjoy this precious time with the baby and family.